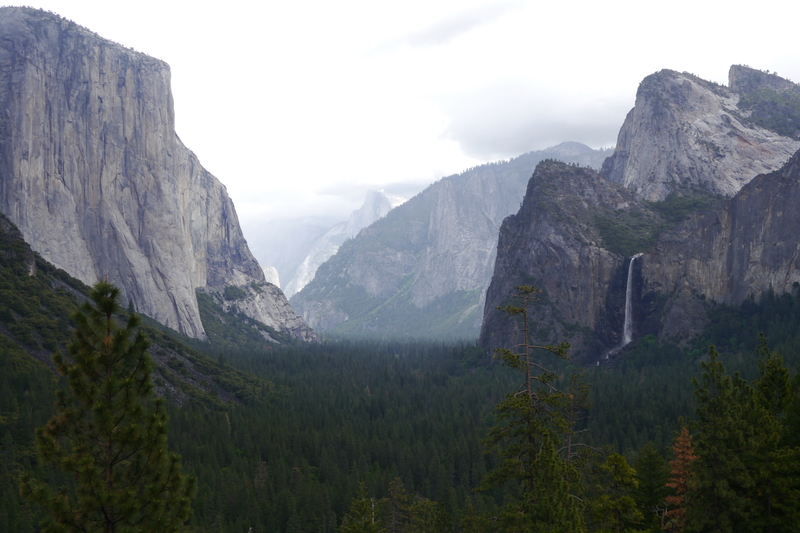 The Yosemite. What words will do this iconic, epic, unlikely, stark and beautiful and breathtakingly expansive landscape justice? Look at Anselm Adam’s photos, read John Muir’s meditations, pick up a National Geographic – it really looks that spectacular! Much to the amazement of some of my 4-wheel-drive / luxury mobile home driving fellow Americans, my tiny Toyota Jaris, miniscule one-woman tent, very basic BBQ equipment and me, myself and I all by ourselves got me up and down those snowy mountain passes, through some freezing nights in Yosemite Valley campgrounds visited by bear and coyote (the latter I saw trotting between the tents; the former I believe I heard rattling the metal, ‘bear-proof’ food lockers at night though I made a point of drinking so little in the evenings that I would not have to go to the bathroom at night and actually confirm my suspicions about the roaming bears 🙂 and pleasantly solitary hikes to Mirror Lake and Vernal Falls. I would be at the trail by 8am at the latest which meant I could avoid the crowds that only get going in the late morning but there would be other hikers not too far from me on the trail who would at least hear my screams in the event of a mountain lion jumping on me. (There have been attacks and some young children have even been killed by cougars in Yosemite.) Well prepared as I tend to be I had packed my personal alarm device. (In case you don’t know these: they’re a safety device sold to women for personal safety when walking alone at night in the city etc. You pull on it and it let’s out a sound so shrill that it can actually damage the attacker’s hearing – well, hopefully…) Then I realized this might in fact be the best line of defense against cougars and bears, so I’d take it along on my hikes! Thankfully, all remind peaceful.